BANGI, 11 Nov. 2010 – Researchers from Universiti Kebangsaan Malaysia (UKM) will help two NGOs in their efforts to curb drug abuse in the country through various research activities as well as co organising seminars and workshops. This follows the signing of Letters of Intent for Cooperation (LOI) between the university and the Muslim Women Action Organisation (Pertiwi) and the Association for the Prevention of Drug Abuse (Pemadam). Under the LOI, UKM will cooperate in carrying out research on drug abuse as well as cooperate in organising seminars, workshop and other programmes to develop human capital as well as sharing of information and knowledge. 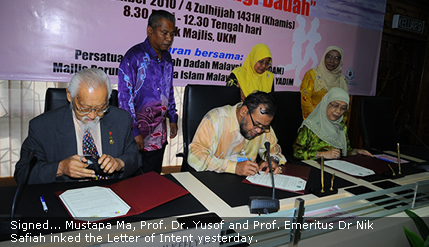 UKM was represented by Director Institute of Islam Hadhari, Prof Dato’ Dr Mohd Yusof Othman; Pertiwi by its Head, Emeritus Prof Datuk Dr Nik Safiah Karim and Pemadam by the Secretary of its International Bureau, Mustapha Ma at the signing ceremony. A forum on “Women in the Fight Against Drug Abuse” was held before the signing ceremony. Chief Assistant Secretary Ministry of Foreign Affairs, Dzulfefly Abdullah; DSP Nafisah Adam, from CID Narcotics, and the Director (Prevention) National Anti Drug Agency, Lasimon Matokrem took part in the forum with Senior Associate Fellow Institute of Islam Hadhari, Associate Prof. Datin Noor Aziah Mohd Awal acted as the moderator. Dzulfekly said participation of women were being encouraged in the fight against the abuse as an increasing number of women were being coerced into becoming drug mules although statistics showed less than two per cent of the 280,000 drug addicts in this country are women. He reminded family members particularly parents to be wary of their children’s activities especially when they wanted to go for a holiday overseas. Parents must be concerned and interested to know who they would be going with and to which countries to avoid them and especially young women from becoming victims of drug syndicates. Young women travellers are more prone to be tricked into becoming drug mules by their new casanova boyfriends, he warned. So far nine women had undergone capital punishment with four in Thailand, two in Singapore and four sentenced to death in China for smuggling drugs. Another 24 women are now languishing in prisons in Thailand, 18 in Australia and another 16 in China with the youngest being only19 years old and the oldest 52. Investigations showed that almost all the drug mules did not have any criminal records in Malaysia and usually worked in the services and sales sector. Dzulfely reminded women not to be easily deceived with offers of well paid jobs overseas and to also be wary of being sweet-talked by foreigners categorised as casanovas. Lasimon told the forum that the agency organized Outreach programmes to help family with problems and those exposed to drug abuse. It also organised visits, love-thy-children programmes besides helping rehabilitation projects. DSP Napisah in outlining police relentless effort in fighting drug smuggling and abuse told the forum that PDRM depended a lot on intelligence gathering. She, nonetheless, assured that the drug problem here is under control compared to other countries especially in Latin America.